On the heels of Susan Boyle's admission that she has Asperger syndrome, Dan Aykroyd opened up this week about his own struggles with that disorder and Tourette's syndrome. In a new interview with the Daily Mail, the Canadian "Ghostbusters" star revealed he was diagnosed with Asperger syndrome in the 1980s, when his wife persuaded him to seek professional help. "One of my symptoms included my obsession with ghosts and law enforcement — I carry around a police badge with me, for example," Aykroyd said. "I became obsessed by Hans Holzer, the greatest ghost hunter ever. That’s when the idea of my film 'Ghostbusters' was born." 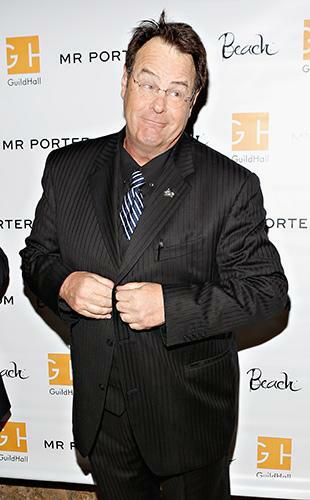 And long before he was diagnosed with high-functioning autism, Aykroyd was told he had Tourette's at only 12 years old. "I had physical tics, nervousness and made grunting noises and it affected how outgoing I was," he told the Daily Mail. "I had therapy which really worked, and by 14 my symptoms eased." The 61-year-old Ottawa native also happens to have heterochromia iridum -- one green eye and one blue -- and syndactyly, which means two of his toes on each foot are webbed. He might also have a long lifespan; his parents are in their 90s and still living on the family farm in Kingston, Ont., and Aykroyd said he plans to live to a ripe old age, too. "I feel I’ve got two or three cat lives left, but want to grow old at the family farmhouse with my great-grandchildren (I have three daughters)," Aykroyd said. "I’m a spiritualist so don’t fear death. I know the spirit survives and once you cross over, everyone’s equal." But before all of that, Aykroyd plans to sate his ghost-hunting obsession one more time with a third "Ghostbusters" installment, which could start shooting as early as 2014. "We're going to really put it into ninth gear, in this third one," Aykroyd said earlier this year. "It's going to be very, very exciting."